Summary : This tea is a nice mix of traditional Rooibos Tea flavor and vanilla. Neither taste is overpowering and mixed together they create a pleasant flavor with little after-taste. Review : As anyone who has read my Vanilla Tea Reviews knows, I've had bad luck - real bad luck actually - in my tastings of teas that are suppose to taste like vanilla. Not only do they usually not taste of vanilla, they usually are just plain bad to begin with and generally find their way down the drain as soon as possible. And so I'm happy to report that this tea is different, in that it is at least not drain cleaner. 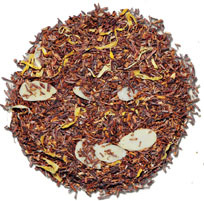 This tea, which is available from Culinary Teas , is a rather pleasant mix of vanilla and traditional rooibos tea flavor. I had some pretty good vibes about this tea after opening up the space age pounch that Culinary Teas packages their samples in. The aroma had a nice hint of vanilla in it, although it was by no means strong. And once brewed, the taste of the tea pretty much matched the smell. A not-overpowering taste of vanilla that is pleasantly mixed in with the typical Rooibos Tea flavor. Now, full disclosure here...this tea is by no means a substitute for "traditional vanilla" things, such as vanilla ice cream, vanilla yogurt, and the list goes on. Thus, if you are searching for that "ice cream replacement", well, keep searching, as you won't find it here. This tea contains the following ingredients : Rooibos, Calendula petals, Almond flakes, Natural flavors. As you can see by the ingredients, no mention is made of vanilla, so I assume it is part of the "natural flavor" that is added. And as far as the almond flakes go, you can see them in this tea easily enough, but you'll have to look far and wide to find the taste of almost in it. In the end, I would classify this tea as a light vanilla-tasting rooibos tea. It makes for a nice switch from traditional Rooibos Teas, and the vanilla taste in it, while not strong, does seem to mix well with the other ingredients found in this tea. Recommendation : Yes. While not a "true vanilla tea" for hard-core vanilla lovers, the tea has both a pleasant aroma and flavor. The after-taste is short-lived and pretty weak, though. Brewing Instructions : Use 1 teaspoon of leaves. Pour boiling water over the leaves. Let brew for 7 to 10 minutes. Dragonwater Strawberry Cream Rooibos Tea : A moderately strong strawberry flavored tea that is pleasant to drink and which has no bitterness. Little Snowbird's Maple in the Morning Rooibos Tea : A tea that smells and tastes amazingly close to maple syrup and possesses a lingering after-taste. Adagio Teas Rooibos Vanilla Tea : A tea with a strong vanilla flavor that sadly is no replacement for vanilla ice cream.